We started our Mani trip in Kardamyli, which was (according to the Iliad) one of the seven cities offered by Agamemnon to Achilles (the best warrior the Greeks had at the time), to stop him sulking in his tent over some slave girl. Bloody Gen-whatever they had then. It’s a pretty little town, with good places to swim, and fine walks in the mountains behind the town. The guidebook warned of hiking hoards (there is even a walking shop in the town - shock horror), but we never met anyone else on our perambulations. The mother of the owner of the place we stayed gave us pomegranates from her tree and walnuts that were drying (in their shells) on the back step. It was a fine addition to breakfast - fresh figs, cereal, yogurt and honey being food of choice at the time. Note: Photos on this page a mixture of mine and Geoff's. Assume the best ones are his and the ones with him in are mine! The picture at the top is of Stravropigi. From Kardamyli we headed south to Areopoli, which has a fine, if touristy, old part of town and the last bank before the Deep Mani. We heard banks can't keep their systems running because the electricity isn’t reliable enough - though we didn’t have problems with power cuts. Just south of Areopoli are the most extraordinary caves I’ve ever seen - and New Zealand is no slouch when it comes to fine caves. More on them in another blog. We’d intended to go from Areopoli down the west coast of the peninsula and then back up the east. But we discovered when we tried to drag Sam out on a walk that he’d selfishly grown out of his shoes. (Good anti-walking plan, Sam!) We enquired and were reliably informed that Gythio, at the top of the Mani on the east side, was THE place for shoe shopping. For such trivial things are great travel plans changed. So we went to Gythio and bought shoes. And (I admit it) I splashed out on a bikini at a wonderful old-fashioned lingerie shop run by a large, enthusiastic and unembarrassed seller of bras and bikinis. It’s the first bikini I’ve owned since I was a teenager, New Zealand being more into covering up than exposing one’s wobbly middle regions. Oh the excitement of a (possibly) brown stomach. Gythio, as I’ve mentioned before, is where Helen and Troy did the dastardly deed that sparked the Trojan war. It’s a pretty place with - in our experience - surprisingly disappointing seafood. Looked better than it tasted. Still, with grey skies, the dramatic tower houses and the burned-out, rock-ridden landscape, it was impressively bleak. 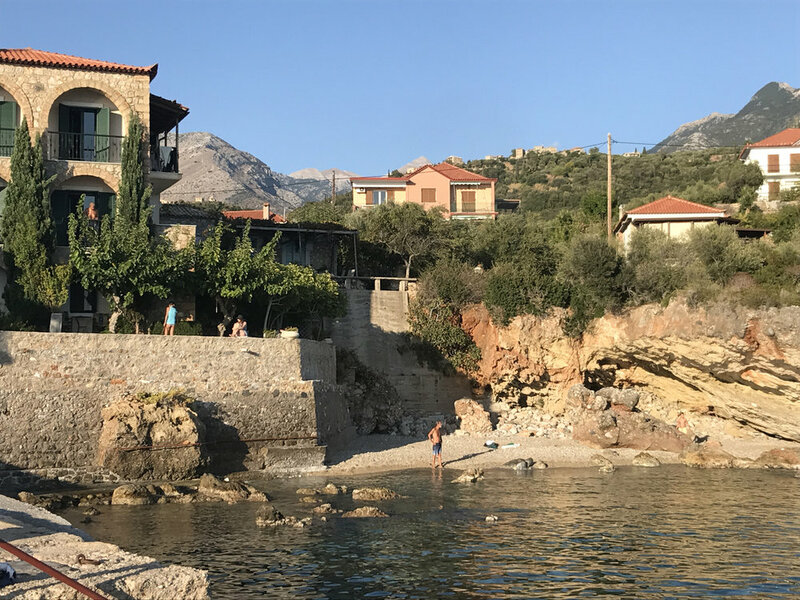 We spent a long time wandering around Flomochori, which doesn't even rate a mention in either of our guide books, but is rather gorgeous, with a fine crop of tower houses. Check here for a selection of photos - it's not hard to imagine feuding families shooting at each other from the tower windows, and could those stains down the walls be from the boiling oil... ? After Flomochori we few nights at Alypa Cove - mostly because we could. (It’s so lovely it’s worthy of its own blog - to follow.) And then we went further south, basing ourselves for four nights in the surprisingly smart harbour of Gerolimenas. Actually, the town, which sits under a huge cliff, is on its second heyday. In the 1870s it was a booming commercial port, exporting 7000 of the then local delicacy - quails - to France each month. It’s not hard to imagine why that trade dried up (bye-bye little quails). 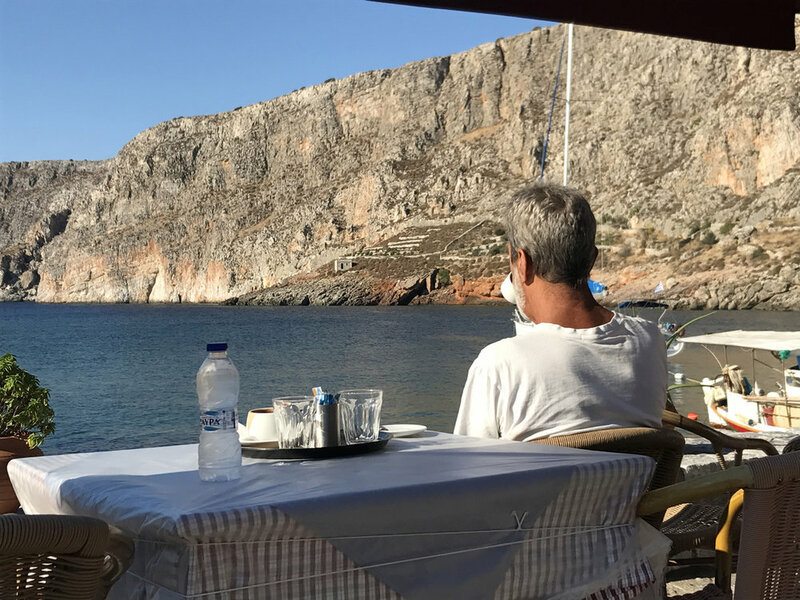 The waterfront at Gerolimenas, and (below) Geoff admiring said waterfront. It's frustrating how you can't even order a cup of coffee in a tourist cafe without getting a bottle of water - which has only a vague chance of being recycled. We stayed up the hill above the town and at night heard strange howling noises - not quite dogs, nor cats, nor crying infants. We asked and found out it was a pack of golden jackals, endangered animals that look like a small wolf. Kinda cool. Gerolimenas has luxuries like reasonable Wi-Fi (tho not in our room), so during the day Sam sat in the restaurant of the local hotel doing his schoolwork (and maybe some other computer-related stuff?! 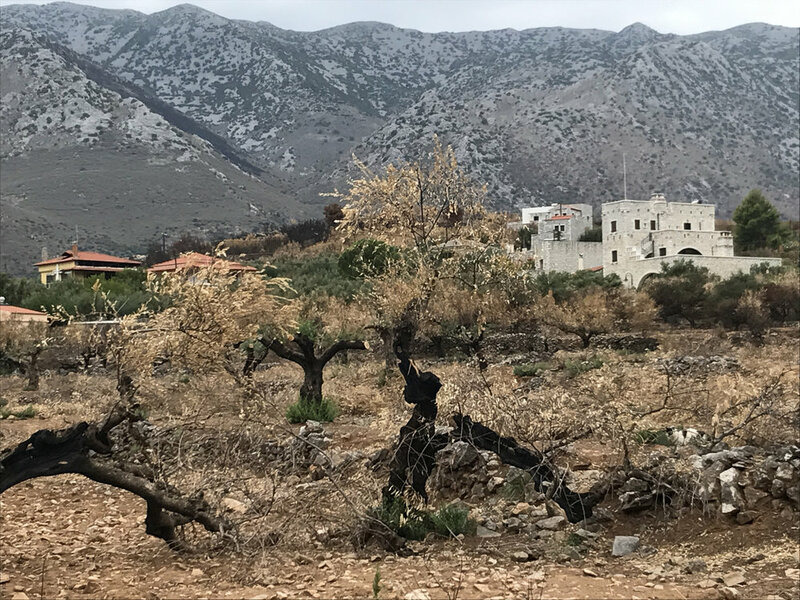 ), and Geoff and I ventured down to the very tip of the country - partly by car, partly on foot, passing through Vathia, one of the more dramatic of the Mesa Mani villages, with its tower houses standing out grimly on the ridge. Cape Tainaron, the southern-most point of Greece, was a thriving hub in Roman times - one of a collection of 20 cities which got together to fight the Spartans. They had their own coinage, dialect and worship. Now there’s a whole lot of not much down there, except an unexpected (and totally unprotected) fragment of a Roman mosaic, a fine lighthouse and a car park full of tourists (like us) wanting to visit nearly the end of Europe. Actually, Tarifa in Spain has that honour, but at least Cape Tairnaron is further south than Tunis and Algiers. Pah to them.